Obba Control Panel. Exception tab: showing exceptions associated with the spreadsheet cell containing the function that raised the exception. 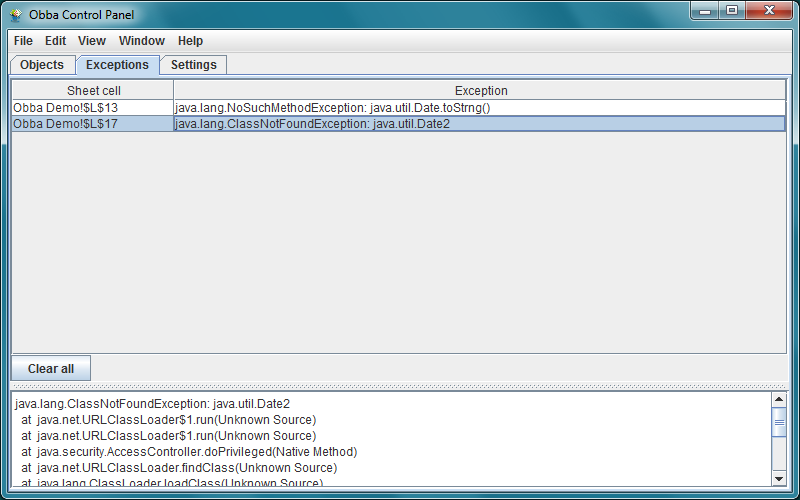 From the Obba Control Panel you may view the last Java exceptions. In Obba for Excel these are listed together with the spreadsheet cell containing the function call which ultimately raised the exception. Note: The feature is not available with Obba for LibreOffice/OpenOffice due to limitations in LibreOffice and OpenOffice (if you like to have this feature, vote for it at Apache OpenOffice Bugzilla or at StackOverflow). If Obba references your Java code, you can run that code under a Java debugger by launching Obba Server directly from your IDE. For details see Obba Developer Documentation. Alternatively you may start Obba server manually with Java debug options and connect a debugger, e.g., via java -agentlib:jdwp=transport=dt_socket,server=y,suspend=n,address=8000 -jar Obba.jar (and connect the debugger to port 8000). 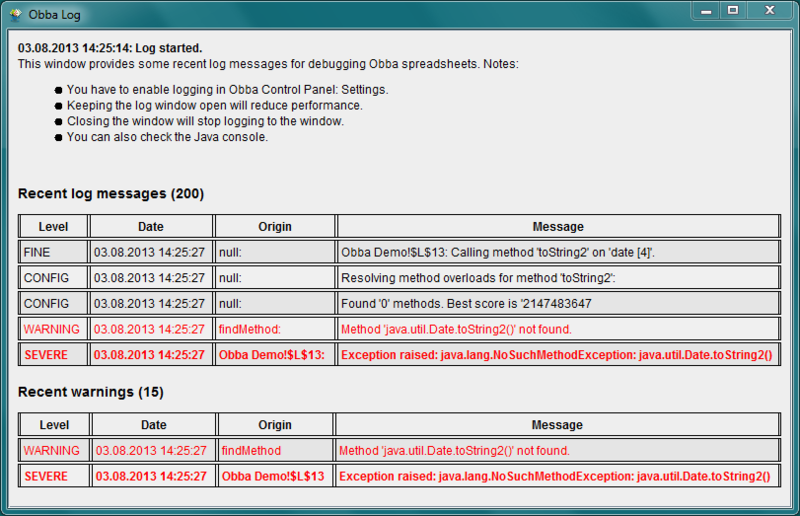 Obba uses the standard java.util.logging.Logger. By default logging is enabled. The java default is to send log output to the console. By default, the log file will be created in your home directory. To view the log file, a log viewer like OtrosLogViewer may come in handy. To view the log, a log viewer like OtrosLogViewer may come in handy. You can start a small log viewer via Obba Control Panel: Windows: Show Log Window. Here you find details which objects where created under which label and which objects were accessed. The most common mistake when using Obba function calls is to pass a literal value where an object handle is expected. See "Passing Literals" in the Obba documentation. Spreadsheet does not calculate or hangs. The spreadsheet client tries to connect to a server using the settings in ObbaClient.properties or the default settings (which is looking on the client machine at port 10000). If a server cannot be found, the client will start a local server automatically. This may take a while. If the local server cannot be started the client will retry, eventually give up and the sheet will not calculate Obba functions. In this case try to manually start a server and if that fails check for the error message (see below). Unable to start server manually. If you start an Obba server manually and you see the error message Unable to start server. this is likely due server being unable to open the specified tcp/ip port. The default port for Obba server is 10000. In this case, check if another program using port 10000 is already running (this could be another Obba server). Adding a reference to Obba in order to use the Obba functions from VBA. Although Obba allows to create Java enabled sheets without any glue code, you can of course use Obba from VBA. Load Obba.xla if it is not already loaded. Open Visual Basic Editor from your Excel Workbook. Make a reference to Obba by selecting Tools -> References... (see Screenshoot). You may now use the Obba functions in VBA. Save your Excel file in xls format. Open that file (.xls edited with Excel) in OpenOffice. All calls to Obba will start with #NAME! 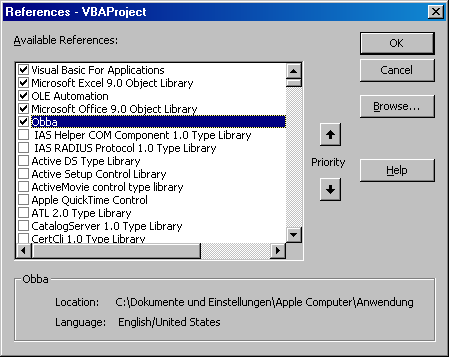 (because the name of the Obba for Excel add-in is not mapped to the Obba for OpenOffice add-in). Leave the "Replace" field empty. Select "More Options" and then "Search in all sheets". Save the file in odt format. Save your file with OpenOffice in xls format. Open that file (.xls edited with OpenOffice) in Excel. All calls to Obba will perform correctly, but the cell shows #NAME (because the function is not recognized as being associated with the Obba for Excel Add-In). Note: Replacing "=" with "=" does not change anything in the sheet, but formulas will be reinterpreted. As a result, the Obba function calls will be associated with the "Obba for Excel" add-in. Ensure that this is applied to the whole workbook. Save the file in xls format. Save your file with OpenOffice in xlsx format. Open that file (.xlsx edited with OpenOffice) in Excel. All calls to Obba will fail, because all Obba functions will start with a prefix INFO.OBBA.OBBA. (because the name of the Obba for OpenOffice add-in is not mapped to the Obba for Excel add-in). Note: Note that the is a dot (.) at the end of INFO.OBBA.INFO.. The value in the Replace with:-field is an empty string. Ensure that this is applied to the whole workbook. You can edit an existing policy file in your home folder. You can create a new policy file in your home folder. You can add a profile and point to it using a parameter of the Java runtime. You can edit the system wide policy file. See also Default Policy Implementation and Policy File Syntax. Note: java.home refers to the value of the system property named "java.home", which specifies the directory that houses the runtime environment - either the jre directory in the Java 2 SDK or the top-level directory of the Java 2 Runtime Environment. On Windows the system wide policy file for the system JRE is java.home\lib\security\java.policy. The user specific policy file is .java.policy and located in %USERPROFILE%. If you do not have a .java.policy file in your %USERPROFILE% folder, then you can create one. If Windows does not let you create the file (since it filename has to start with a dot), then copy the file from the ZIP archive below to your %USERPROFILE%. On Unix the system wide policy file for the system JRE is java.home/lib/security/java.policy. On Mac OS X the system wide policy file for the system JRE is java.policy and located in /Library/Java/Home/lib/security/. The user specific policy file is .java.policy and located in $HOME. If you want to add an additional policy file having a different name or in a different folder, then you need to add the following argument to the JRE: -Djava.security.policy=someURL where someURL is the path to the policy file (using /, not the backslash). (Note: It may be advisable to add a restriction to the codebase). You have to update to LibreOffice 4.0.2. Version 4.0.0 and 4.0.1 did not support recalculation of external macros on load, which left Obba sheets in an inconsistent state. Installing Obba.oxt results in the error message Could not create Java implementation loader. Solution: Obba needs a Java runtime and the Java runtime has to be enabled in LibreOffice. Enable the Java runtime in Tools -> Options -> Advanced (Windows) or LibreOffice -> Preferences -> Advanced (OS X). OpenOffice not loading libraries with relative path. In some cases the spreadsheet functions obAddJar, obAddAllJar, and obAddClasses may fail to resolve the absolute path to the library/libraries, when used with a relative path, i.e., if their second argument is TRUE(). The problem is due to a bug in OpenOffice which does not allow resolving the absolute path of a spreadsheet at load time. In order to work, the functions hence use a so called volatile result and update the path, once it is available. However, volatile results are problematic since two identical function calls (same function with same arguments) have to return the same result (note: we have suggested a corresponding feature request to the OpenOffice dev team). If a function obAddJar, obAddAllJar, and obAddClasses appears with the exact same arguments in different sheets (open at the same time), the absolute path will always resolve to that of the workbook opended last. Solution: If you work with sheets which use obAddJar, obAddAllJar, and obAddClasses and relative paths, make sure that all open workbooks reside in the same folder or the functions calls differ in their arguments. This is for example the case for the sheets in the Demo folder of the Obba distribution archive. Ubuntu Software Center: You need to install the full OpenOffice.org Office Suite. Solution: Ensure that you have enable a Java Runtime in OpenOffice. Check OpenOffice->Preferences->Java or Tools->Options->Java. If that does not help, reinstall the "OpenOffice.org Office Suite" from the Ubuntu Software Center. It is not sufficient to install "OpenOffice.org Spreadsheet" only and a separate JRE. What follows are tips which are not directly related to Obba itself, but might be useful in some application of Obba. Use pkill -f with the exact command line used to launch the server, e.g. : given the Obba Server was launched via java -jar Obba.jar you can stop it via pkill -f "java -jar Obba.jar". The process can the be killed via taskkill /fi "WINDOWTITLE eq ObbaServer*"